This rustic log home in a country setting allows you to enjoy the breathtaking view from the deck or sit back and gaze out the picture windows from inside the home. 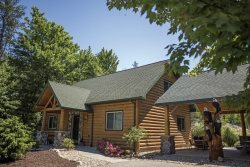 Perfect for all seasons, this log home is not far from the Wisconsin Dells, yet in your own little world. Enjoy the wildlife, sledding hill and much more. This home features three full bedrooms including a master bedroom with private bath and DVD plus additional sleeping for two in the lower level, spacious great room with full kitchen, dining area, living area with a wood burning fireplace, central A/C, Direct TV package with HD TV, DVR and Blue Ray player, WIFI and 2 full baths. Everything you've wanted for a break away from it all. Only 3 miles from Lake Redstone where you can enjoy water activities if you choose to bring a boat. We liked the log home. Very rustic and cozy. We had a great family vacation. It was a beautiful spacious house surrounded by nature. Exactly what we were looking for. The keys were not in the packet, and the gentleman at the counter met us at Kohls to bring them to us. I thought that was very accommodating. Our children and grandchildren had a wonderful time, as did we. the team is great. We've been renting for 19 years. Always great service and friendly staff. Everyone at sandcounty is very friendly & helpful.. you guys are great & we always feel very welcome..
We have been using Sand County Service Company for over 15 years. Their service has always been excellent. The staff is so nice and friendly. We look forward to continue using Sand County for our future vacations. We love Pleasant View. It's so peaceful and the view is amazing. Thank you so much! Pleasant. George and Tammy were wonderful to work with and very accommodating !!!!!!! Absolutely spectactur view and very homey cabin feel out in the country. Staff was great. I arrived to the property close to closing hours and I called about 3 times about some questions I had when I arrived, one of those calls was after the office had just closed but the staff member answered my call every time and he couldn't have been more polite. Pleasant view was a great experience! Already looking into my next vacation at this property. The tranquility is unbeatable, the home is spacious for everyone to hang out indoors or outdoors. It had everything I needed, and the cleanliness of this property inside and out was more than I expected! I will definitely be back! The experience was great. The view was beautiful. The house was comfortable and had a great view. This is our second visit to your property; both experiences have been wonderful! The guy who I checked in with couldn't of been any nicer! !